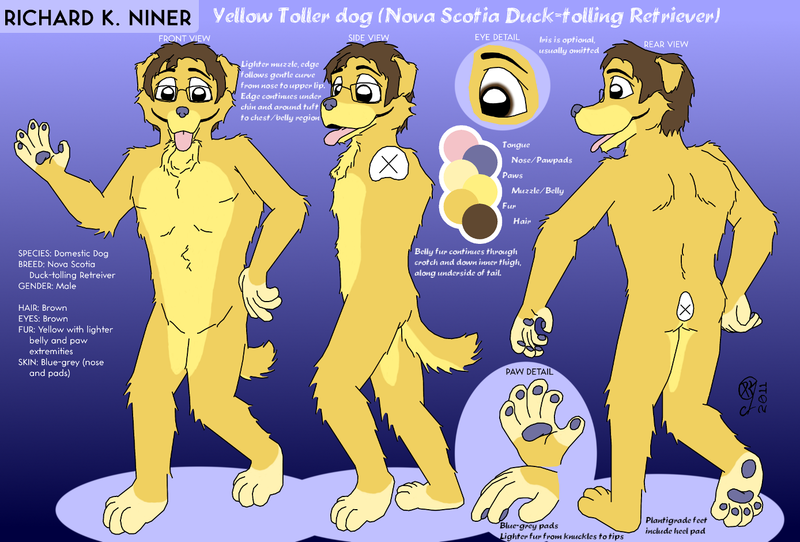 Richard K Niner is an anthropomorphic Nova Scotia duck-tolling retriever (toller for short, a breed of dog) with yellow fur and dark brown hair. Often found wearing his glasses, and usually clothed in his open blue shirt and khaki shorts (or pants, depending on the weather), he is friendly and playful to those around him. As shown above, RK has golden yellow fur covering most of his body. His paw pads and nose are blue, and his hair has a brown colour. The fur on his paws is cream-coloured, and a bright yellow underbelly extends from muzzle down to inner thigh, and along the underside of his tail. His tail curves up from near the bottom of his spine, uninterrupted in that golden yellow from base to tip; its length matches that of RK's thigh. RK has long droopy ears, extending down to his mouthline, where their tips rest behind his cheekfur. There is a natural middle part in his hair, that extends down just below the cheekfur in the back; a single lock of hair reaches his right eyebrow. The yellow underbelly begins at his nose, covering the front and sides of his muzzle under an arc stopping right where his lips curve upward; the underbelly continues to cover his entire jaw and chest tuft. When his mouth is open, RK lets his pink tongue hang out, panting softly. The canine adopts a plantigrade posture, with blue pads on each of his toes, the balls of his feet, and under his heel. His humanoid handpaws adopt a similarly cartoonish look in their pad placements. Cream fur covers his toes, soles, fingers and knuckles.